Find out if you’re a sinner or a saint on the Corkscrew City Tour | Rrampt. 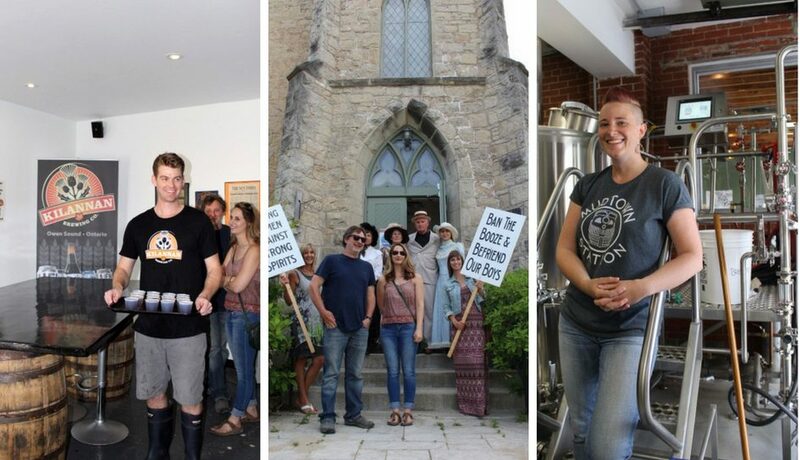 If you’ve ever wondered whether you’re a sinner or a saint, it won’t take you long to find out on the Corkscrew City Tour, one of the exciting new additions to Owen Sound tourism this summer. 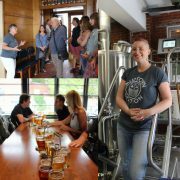 Rrampt decided to hop on the Beer Bus this past Friday and take the epic tour through breweries, landmarks, museums, and pubs. And I learned exactly which category I fall into, or at least would have fallen into at a few points in the city’s history. 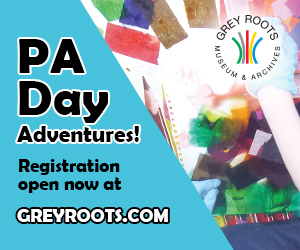 Richard Thomas, our trusted guide and author of Saints and Sinners, sets the scene at Grey Roots Museum for the events that would unfold from the late 19th Century to the present day, and it’s packed full of interesting characters, corrupt politics, and surprising events. Thomas divulges early in the tour what his sinner/saint status would be, and I have a feeling I’d be standing on that side of the fence with him by the time the day was over. Let’s just say that neither of us is shy to have a sip or two of whisky, or the odd pint. 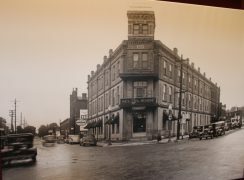 The Saints and Sinners exhibit showcases the Owen Sound of old, a wild west where sailors descended on the town in search of booze and loose women. The number of brothels and bars during this era will make your head spin. And one extreme deserves another, a fortified temperance movement set to abolish booze altogether. And this dialectic played out on two corners of town labeled Damnation and Salvation. The town eventually settled for a balance, one that allows alcohol, but limits the number of establishments. But it took a hell of a long time! The tour has a little something for everybody – great local craft beers, performances in historic buildings, and a great meal at the city’s newest brewpub on the water. And of course, you’ll learn all about the fascinating history of the one-time busiest harbour in Canada. 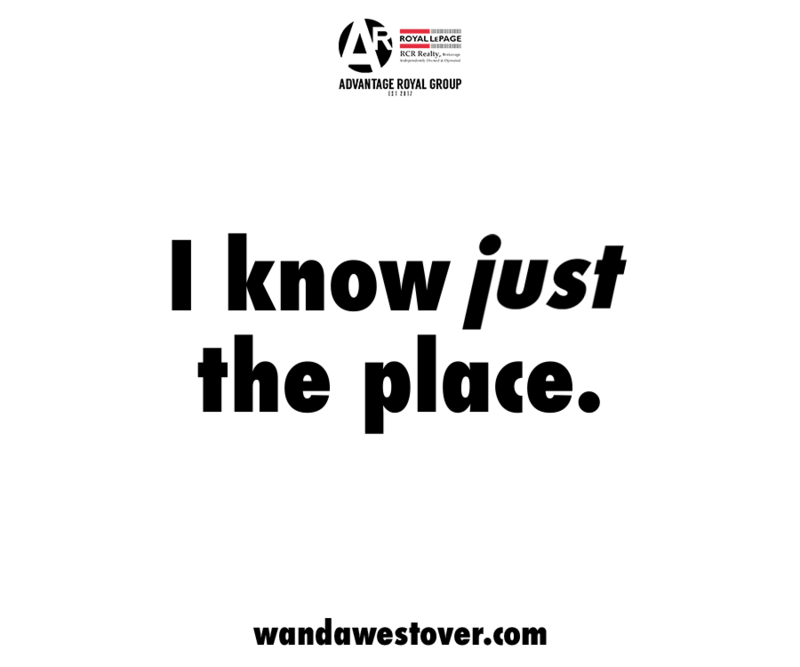 For instance, did you know why Owen Sound is on a grid system when it was never meant to be? Why did the city stay ‘dry’ until 1972? And why the hell is it called Corkscrew City anyways? 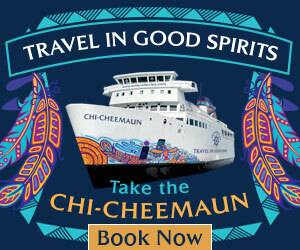 You’ll get answers to all these questions on the four-hour adventure that’s centred around that devilish liquid that got so many Owen Sound-ers up in arms for so many years. 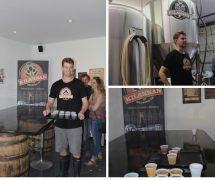 Our group of nine hopped aboard the Bus for Kilannan Brewery where a little recent history has been made: the youngest brewmaster in Canada, Spencer Wareham detailed his process for brewing beer but also how he acquired a business loan at such an early age. This is where our first tasting occurred as we were treated to a sampling of four of his finest ales, one of which was my favourite Kolsch. Trivia question: before we boarded the bus, he told us where the name Kilannan came from. Any guesses? You’ll probably still be a little unsure about your sinner/saint status after Kilannan; after all, the beers are all sample sized, so it’s a very classy affair. But when you arrive at the old Women’s Temperance Hall, you’ll find out pretty quickly which side you fall on. 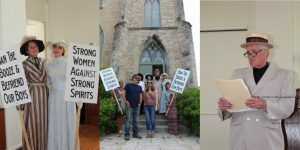 The performance is acted out flawlessly by the Owen Sound Little Theatre and really gives you a sense of the prohibition debate and how adamant the temperance movement was. In fitting form, they offer tea and scones from the Milk Maid in Owen Sound, an establishment that has recently taken advantage of Owen Sound’s ‘wet’ status as it added beer and wine to its menu only a short while ago. Trivia: can you tell which current building was once the Women’s Temperance Hall? The most authentic stop on the tour might also be the loudest as the Beer Bus pulled up to the old Seldon House, which is now fondly termed ‘The Pub’ and is still a meeting place for the folks of Mudtown to wet their whistle on a Friday afternoon. 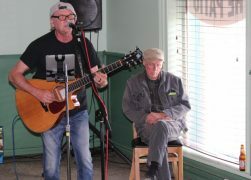 We were tucked into the back room with some Coffin Ridge ciders, where the previous poet laureates and cultural icons Rob Rolfe and Larry Jensen entertained us with songs and spoken word pieces on the part of town that used to house the blue collar workers. The factories are all gone, but the stories are still very much part of our culture. Trivia: do you know why the Mudtown region got its name? Just down on the border of where Mudtown used to begin, is where the tour ends. Tucked in behind the old Circle Bar Hosiery factory sits the old train station that has recently been fashioned into a gorgeous brewpub with all the heritage kept in tact, including the ticket booth and old bathrooms (we got a tour of them). The Kloeze family served us a meal from chef Tyler Cunningham, a sampler of beers, and tour of the brewery by Morag. Trivia: do you know what year the railway station was last operational? After the meal was over and the beer consumed, the bus loaded up and headed back to the Grey Roots Museum. But I had fully adopted my sinner status by this point and decided to stick around for one last beer and a chat with the guide Richard Thomas, poet Rob Rolfe, and musician Larry Jensen. As we sat sinning our lives away, I couldn’t help but remember the Billy Joel line. “I’d rather laugh with the sinners than cry with the saints”, and I thought how much fun it is to be a sinner in Corkscrew City whatever the time period. We had a lot of laughs during the day, and that’s part of what made the experience such a great one.